Thirty-six years is a long run for any rock and roll band, and that's how long Brian Vollmer and Helix have been plugging away at their gig. Vagabond Bones is their twelfth studio album, and features the classic Eighties line up of Vollmer, Brent Doerner, Daryl Gray, and Greg Hinz (as well as former member and co-producer Sean Kelly). Helix is in fine form on this disc, delivering melodic hard rock which swings between boogie rock and roll and straight-up, tap-a-keg, party rock. Vollmer, who is one of the finest rock vocalists in the biz, has never sounded better, very strong and smooth. While Vagabond Bones will never be considered a trend setting disc, all nine tracks are beefy, crank it up, rock songs proving that Helix knows the fundamentals of melodic rock, and having a good time. With quirky, tongue firmly in cheek titles, Bitter's Got the Better of You, Hung Over But Still Hangin' In, and Best Mistake I Never Made, and the crowd-pleasing, arena sounding, Make 'Em Dance and Jack It Up, Helix makes hard rock rowdy, raucous and, well, fun again. The only real flaw here is that it's too short. Helix should have packed at least two, maybe three, more songs into Vagabond Bones. 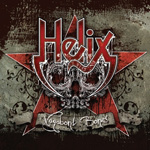 Long running Canadian rockers Helix return with Vagabond Bones, a fine disc of varied and entertaining melodic hard rock.